In keeping with original features. The brief for this Project was to create an extension on the property that was in keeping with the original features, sourcing and using reclaimed materials that match the existing brickwork, slate roof tiles, bespoke Oak exterior and interior doors. 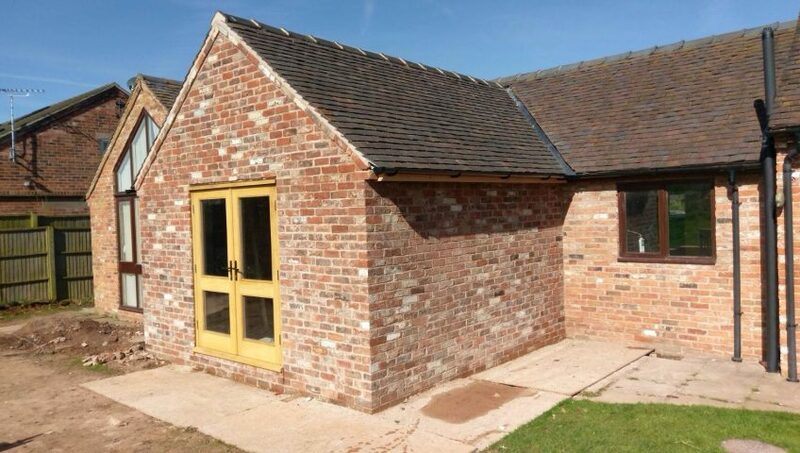 Supply and installation of reclaimed Cheshire brick, and Staffordshire Blue roof tiles. Supply and installation of bespoke Oak french doors. Installation of ‘Barn style’ door casings and doors, including all reclaimed ironmongery. Installation of new electrical under floor heating system, including a fibre reinforced screed floor finish. Installation of oak fascia boards. The criteria for this project was to extend the rear of the property to create an open plan Kitchen-Diner Living space that flows through to a new stone patio area, expanding the scope of the property further into the outdoor garden environment. Supply and installation of bespoke aluminium framed windows, including bi-fold doors and full glazing to the extension gable. Wet under floor heating system installed, including a fibre reinforced screed floor finish. Engineered Oak wood flooring installed, including a wax finish treatment. External Indian stone landscaping, including dwarf walls, flower bays, stepped patio and block paving. All new electrical installation, including external lights. 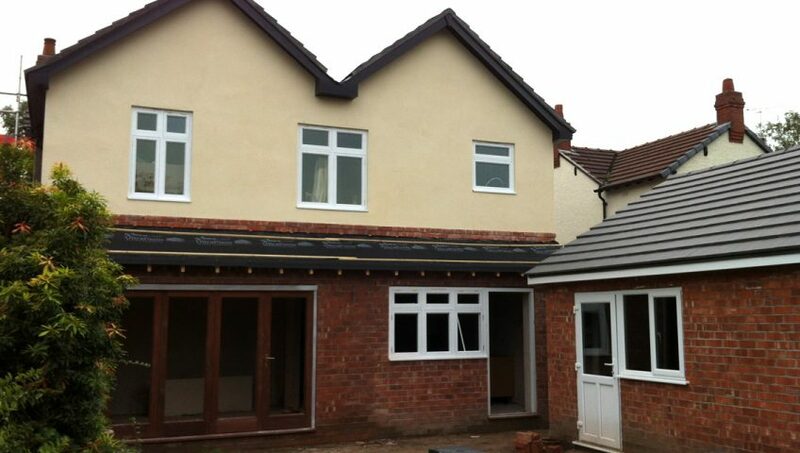 External walls fully rendered to match properties existing exterior. One of our most extensive construction projects to date was designed and constructed to maximise the rear of the property with large bi-fold doors bringing the outside in with warming natural light streaming into the new kitchen area. Kitchen supply and installation, including granite work surfaces, wall and floor tiling. Four separate bathroom suites supplied and installed including tiling. Construction of master bedroom balcony, including EPDM flat roof covering, and glass & Aluminium railing. 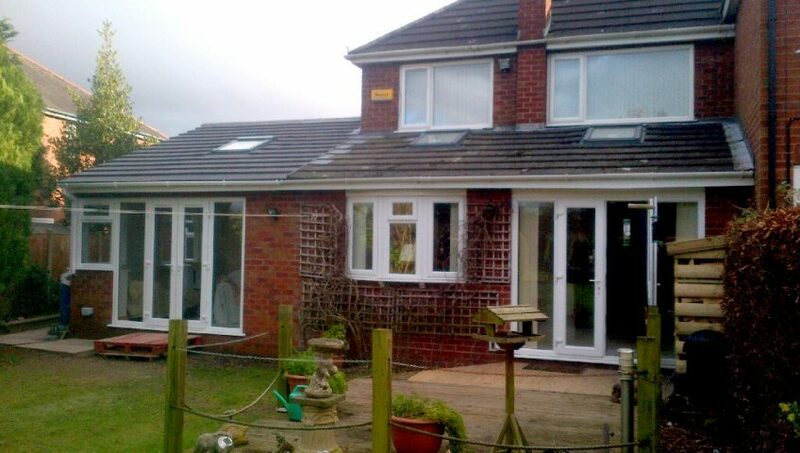 Supply and installation of aluminium framed windows and doors, including 2 x sets of bi-fold doors. Supply and installation of new hard wood doors and ironmongery throughout. Supply and installation of new open tread Oak staircase. Installation of new wood burning stove. Installation of new central heating system, including new boiler. Installation of complete new drainage system, including new septic tank installation. Installation of anti-crack, silicon based K Rend external rendering system. Installation of block paved patio. 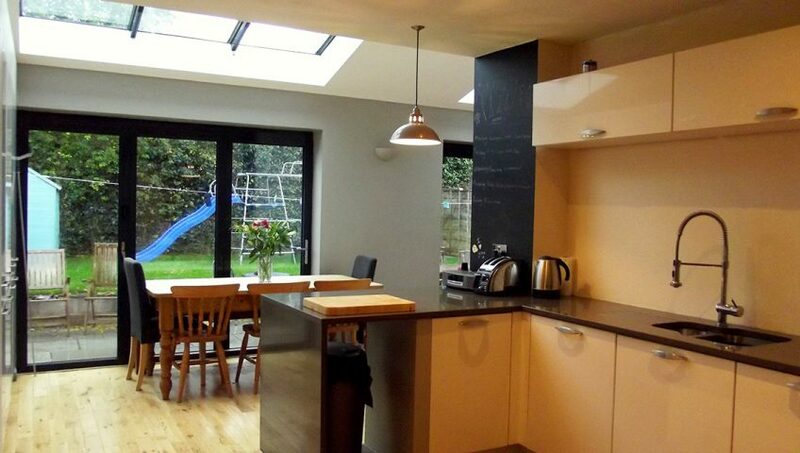 Our brief for this project was to extend the kitchen out to create one open plan kitchen diner. 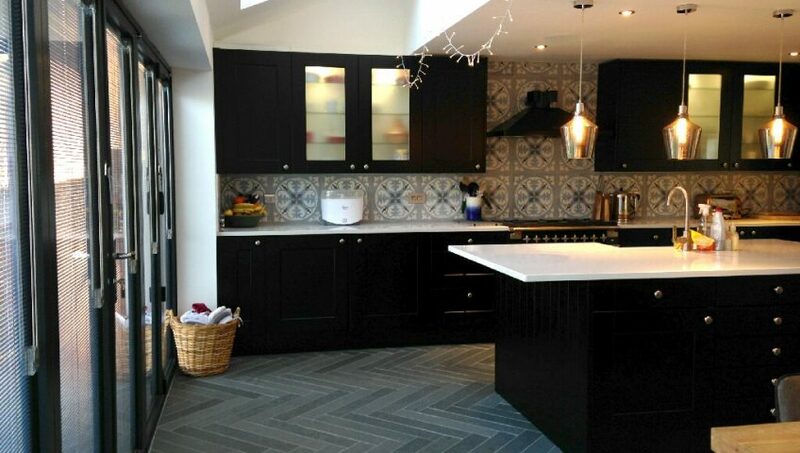 We supplied and installed the entire kitchen to our client’s exacting standards as well as fitting the underfloor heating system and laying the herringbone floor tiles – a truly beautiful result. Supply and installation of aluminium framed windows, including bi-fold doors with integral blinds. Construction of internal decorative, reclaimed brickwork panel. Installation of new under floor heating system. Velux roof light windows installed to vaulted ceiling. All new electrical work, including a fully integrated, hard wired entertainment system. This project involved both a renovation and extension of this property as well as bespoke features such as oak staircases and bespoke windows. Kitchen supply and installation, including granite work surfaces. Three separate bathroom suites supplied and installed including tiling. 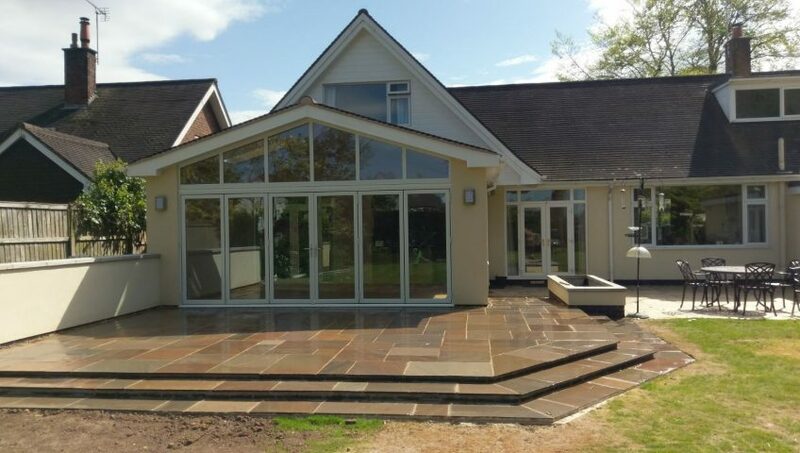 Supply and installation of bespoke, Oak framed stained glass windows and doors, including bi-fold doors. Supply and installation of new Oak staircase. Installation of new heating system, including new boiler. Construction of new Oak Porch. Installation of Indian Stone patio. 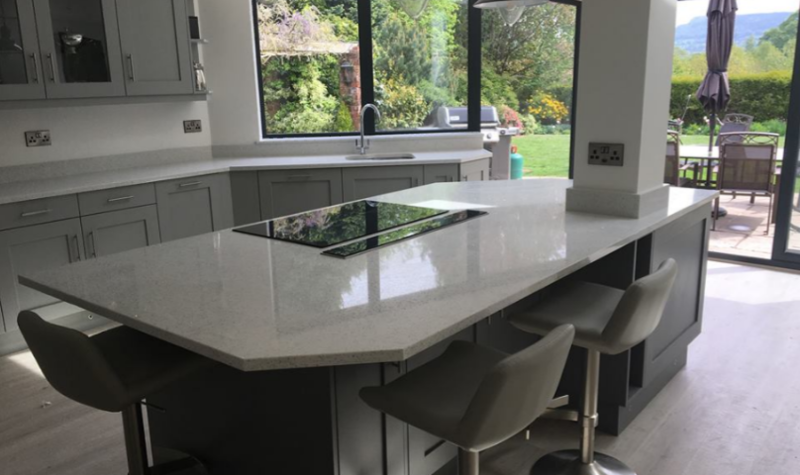 This project’s brief was to build an extension to expand the overall kitchen footprint, including the full kitchen supplied and installed, floor tiling and installation of a downstairs toilet. 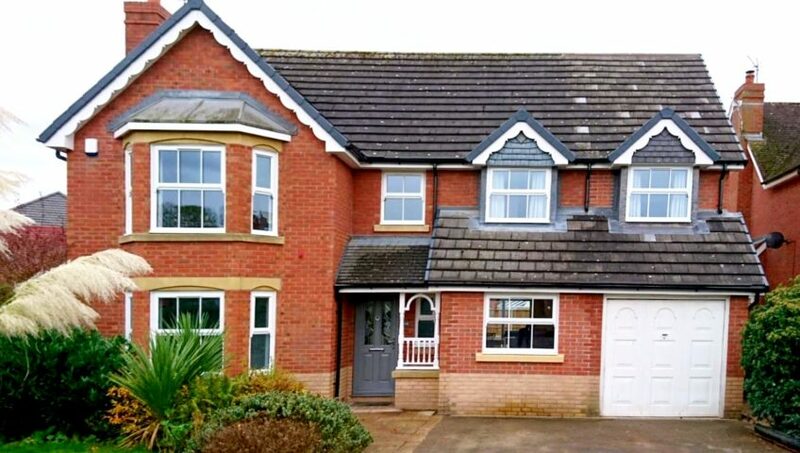 Supply and installation of uPVC windows and doors, including bespoke corner window unit. Installation of new tiled floor covering. Supply and installation of new WC. Construction of decorative brick fire place, including quarry tiled hearth and decorative Oak beam lintel. Velux roof light windows installed, with structural framing to internal ceiling. All new electrical and heating work. With this project we designed and constructed a new open plan kitchen extension for our client making full use of the space we created, adding bi-folding doors as well as large Velux windows. Installation of bespoke aluminium bi-fold doors and roof windows. Installation of new hard wood flooring. Supply and installation of new hard wood doors and ironmongery, throughout the entire ground floor. All new electrical work, including installation of new consumer unit. 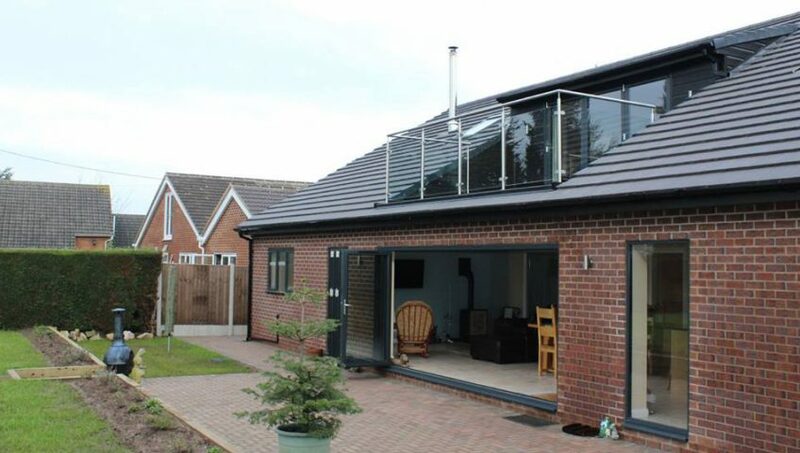 This project’s brief was to extend the living space by adding a ground floor office extension to the side of the house with a finish that blends in with the existing brickwork. 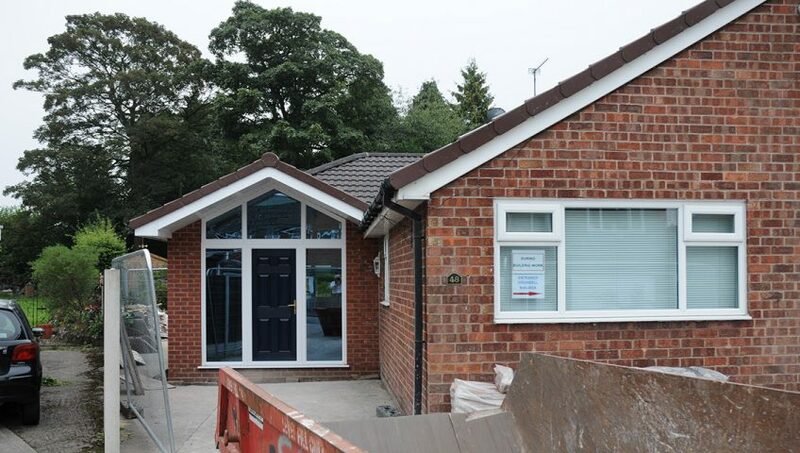 Supply and installation of bespoke uPVC, fully glazed principal entrance. Installation of new WC, including new tiled floor covering. Supply and installation of new hard wood doors and ironmongery, throughout the entire property. Installation of new decorative radiator.